Supertrip spinning fishing rod and reel combo is awesome.The reel has a 5.5:1gear ratio,and is silky smooth while reeling.You can actually feel the motion of a spinner as it spins in the water when fishing.The rod is very solid, which is made of a carbon fiber. Its strong enough to really yank a fish in.It is an amazing combo,and its small and light enough to take camping or backpacking with you. 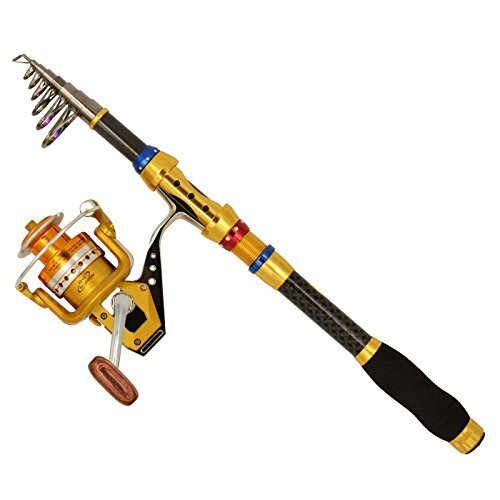 • This fishing rod is made from carbon fiber and alloy,Strength and toughness have greatly improved. • More short body with large spool and large line capacity. • Good elasticity and strong heavy capacity. • The metal block in the end of rod which designed with tightening the screw,more secure and reliable. Telescopic fishing rods are made from high density carbon fiber and alloy, make your fishing pole reliable and durable.Telescopic length design for conveniently carrying around.EVA Fore Grip for comfort. Good touch feeling for the rods. Aluminum fishing reel has front drag,right/left inter-changeable handle, support for both sides,can operate steadily when fishing and make it easy to catch big fish. Long cast spool to cast farther. The fishing rod and reel combos are portable,and closed length design is easy to carry.Opened Length: 1.8m / 5.90ft.Closed Length:approx 45cm / 1.48ft;Only take up a little space in your car or backpack. Model 3000 | Weight 10.58oz/300g | Max Drag 19.84LB/9KG | Gear Ratio 5.5:1 | Line Capacity 0.20mm/270m 0.25/200 0.30/140 | Ball Bearings 12+1BB. These fishing rods and reels are not including a Fishing Rod Holder or a Fishing Lure? If you want, please search the ASIN: B016QNPWBQ or B0140U8M0U.